It was only about six months ago when I started to enjoy eggplant dishes. It was only about two months ago when I started to buy eggplant and make dishes with it myself. It was only about two days ago when I decided that I want to plant eggplant in my garden – it happened right after I took my first bite of this dish. I had some veggies ripe for the picking in my garden: zucchini, scallopini squash, and okra, not to mention an abundance of cilantro. Once I picked the okra I couldn’t get the idea of making something southern, something Cajun, something that made me think of New Orleans out of my head … and that’s when I decided that I had to make jambalaya. Is there actually okra in jambalaya? I don’t know. I’ve never had jambalaya. Jambalaya, however, was what I decided to call my dish, and I apologize to any tried and true New Orleanites out there who may take offense at my incarnation listed below. This dish was adapted from a recipe found on Epicurious.com and I have listed two different way to make it. 1. Cut the eggplants in half and scoop out the flesh, leaving ½ inch shells. Reserve the scooped out eggplant. In a pot of boiling salted water blanch the eggplant shells in batched for 4 minutes and then drain them upside down on paper towels. 2. In a large skillet heat the olive oil over medium heat. Sauté the garlic for 30 seconds, add the onion and reserved eggplant and cook for 5 minutes. Add the zucchini, scaloppini squash, okra, and bell pepper and cook for 10 minutes. Add the tomato and sausage and cook for an additional 5 minutes. Remove the vegetables from heat. Stir in the red pepper flakes, the parsley, the salt and pepper, and the rice. 3. Divide the mixture among the eggplant shells and place the eggplant shells in two shallow baking pans, and add ¾ cup water to each pan. Cover each pan with foil and bake the eggplants in a preheated 350F for 30 minutes. 4. Combine the bread crumbs and the soy cheese in a small bowl. 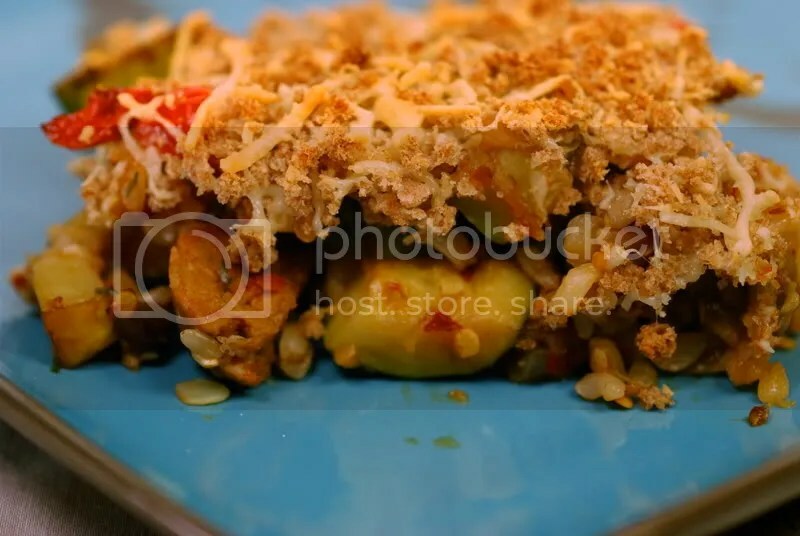 Remove the bakes eggplants from the oven and sprinkle the breadcrumb mixture. Broil them under a preheated broiler for 2 to 3 minutes or until the topping is golden. Garnish with cilantro. Or …. you can do what I actually did, which was …. 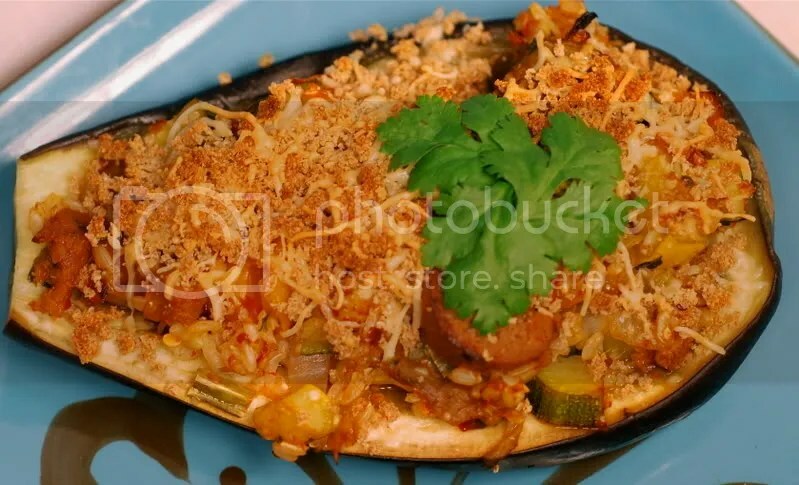 instead of using three eggplants and making six eggplant boats to serve six people, you can use one eggplant to make two eggplant boats to serve two and save the rest of the veggies (without baking) for the next night. 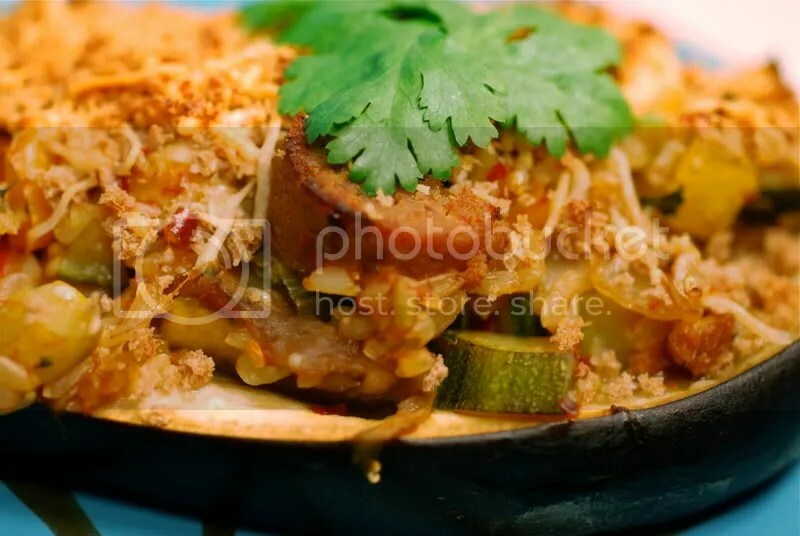 The second time around, put the veggies in a small, lightly greased baking dish, bake for 25 minutes, sprinkle bread crumbs and soy cheese on time, broil until golden, and serve as a casserole. Voila – dinner two ways! Although I’m not a true New Orleanian, I’ve been living in these parts long enough to say that I think that okra is okay in jambalaya. i know you can put it gumbo, so why not? Funny you should make a Cajun dish this week given that it’s almost Mardi Gras…. Speaking of which in honor of Jennifer’s fabulous Krewe of Muses (which their parade happens to be rolling tonight) any chance that you could veganize a king cake? I’m waiting for the day I reclaim my own kitchen so that I might be able to try some of these fantastic recipes you’ve been posting…. Mmmm…wouldn’t you know I have an eggplant in the fridge just waiting to be used…. Courtney – I hope that you put that eggplant to good use! Gail, Happy Mardi Gras…. I’ll be curious to see how it comes out when you should get a chance and a notion to do it. King Cake is one of those things that never really changes, so it will be interesting to see a another take on it.